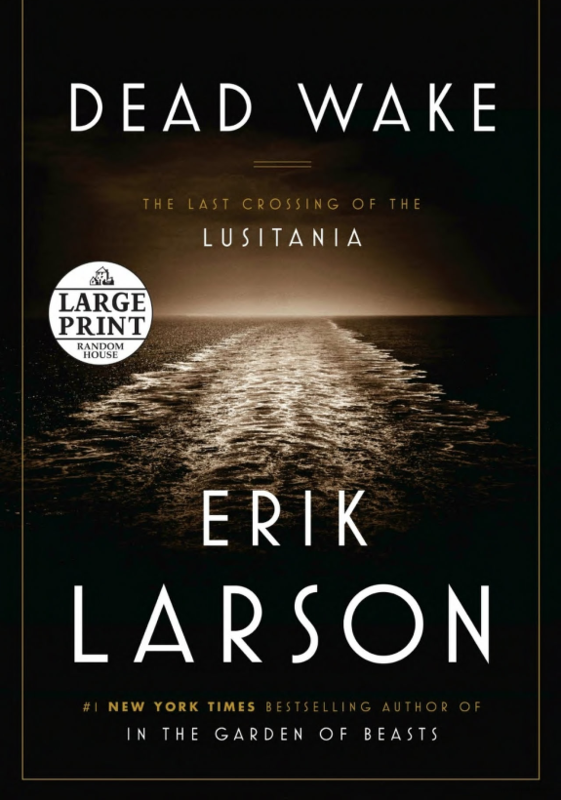 Garrettsville – The Book Discussion Club of the Garrettsville branch of the Portage County District Library will meet on Tuesday May 15, 2018, in the library meeting room from 5-6 p.m.
On May 7, 1915, the passenger steamer Lusitania sank after encountering a German submarine just off the coast of Ireland. The Lusitania was travelling from New York City to Liverpool with an international passenger list that included many women and children. In 18 tragic minutes the lives of about 1200 people were lost as Germany’s new policy of unrestricted warfare allowed Walther Schwieger to fire a torpedo at the ship. Larson brings intimate details full of glamour and drama to life in this novel while exploring contributing factors such as fog and a second explosion. Patrons may sign up for the Book Discussion Club at the Reference desk, where copies of the book are available. The Library, located at 10482 South Street, Garrettsville, OH 44231 is open Monday through Wednesday, 10:00am – 8:00pm; Friday, 10:00am – 6:00pm, Saturday 9:00 – 5:00, and closed Thursdays and Sundays.